A tooth extraction is “the removal of a tooth from its socket in the bone” (source: Colgate). The primary goal of a dentist is to promote and maintain good oral health for all of his/her patients. Good oral health leads to numerous benefits including improved overall health. However, there are some scenarios when a tooth extraction is necessary to maintain the oral health of the patient. What Are The Main Reasons For A Tooth Extraction? Unrestorable. The dentist is not able to fix, repair or restore the tooth. Financial Reasons. Sometimes the investment of repairing the tooth is greater than the patient can afford. Other times, the long-term prognosis of the tooth is not good enough to make the financial investment worthwhile in the first place. Baby Teeth. Sometimes baby teeth don’t fall out in time to allow permanent teeth to come in. Lack of Space In the Mouth. Sometimes, patients that are getting braces, need to have one or more teeth extracted to make room for other teeth to be moved into place. Wisdom Teeth. Wisdom teeth are also known as third molars in the dental world. They can be extracted before or after they come in. They usually come in during the late teens or early 20s. What Are The Different Types Of Tooth Extractions? There are several types of tooth extractions depending on the position of the tooth that needs to be removed and how difficult the tooth is to loosen and remove. Simple Extraction. 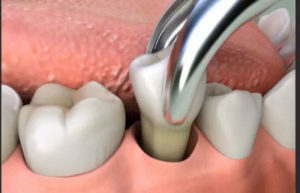 If the tooth has erupted (meaning it can be seen in the mouth), general dentists can usually do a simple extraction. Surgical Extraction. If the tooth has broken off in the gum or has not come into the mouth, a more complex extraction, known as a surgical extraction, may be necessary. In this scenario, we may refer the patient to an Oral and Maxillofacial Surgeon to have the tooth extracted. Keep in mind, all cases are different. We recommend having your dentist properly evaluate and consult with you on your specific case. If you just had a tooth extraction at Montana Roots Dental Care, you can find the post-op instructions on our post-surgery instructions page. You can also download a PDF of the post-surgery instructions here. If you think you need a tooth extraction, please contact us, and we will try to fit you into our schedule as soon as possible. Give us a call (406) 442-0282.